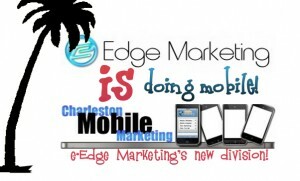 Charleston Mobile Marketing, the local mobile marketing division of e-Edge Marketing, serves the Charleston, SC market. e-Edge Marketing, the parent company, has headquarters in Summerville SC and serves clients with their marketing needs throughout the U.S.A.
Charleston Mobile Marketing, proudly serves the greater Charleston area and throughout the lowcountry area which includes the tri-county area of Charleston County along with Berkeley and Dorchester Counties. We welcome the opportunity to speak to you about whether mobile marketing might be a good fit for your Charleston business. For more information, or to contact us for a free consultation, Call 843-647-0489 or toll free 866-945-9707 today!